"The Movie at the End of the World" is a compilation documentary about the life and work of the late North Dakota poet, Thomas McGrath. Also known as Dream Champ, Tommie the Commie, Crazy Horse, Peasant Poet, Longshot O'Leary and Tom Fool, McGrath wrote thirty books of poems, two novels, a couple books for children and some twenty scripts for feature and documentary films. In the film we see Tom exploring his birthplace near Sheldon, North Dakota, looking around at a steam threshers reunion in Rollag, Minnesota, teaching at Moorhead State University, visiting his lookalike brother Martin who worked at the Tonka Toy factory, watching his son Tomasito play soccer, writing at home and giving a fine poetry reading at the Rourke Art Museum. Narrated by Frederick Manfred, shot by Jim Mulligan, and written, edited and directed by Mike Hazard and Paul Burtness, the film features a fine collection of poems as well as a lively suite of pieces from his film work. Running 56:56, it premiered in 1982, then was remastered with a new mix in 1990 upon the poet's death. Looked at in one way, the movie is a triptych. Each of the three sections can be seen as an illumination of a line from the poet's epic masterpiece, Letter to an Imaginary Friend: History is the labyrinth, labor the low high road and art the curved arrow to our common heaven. The first part is about making bread, the second about earning it and the third about the hunger for it. Threaded with a number of audiovisual experiments with poetry, the program has stolen its title from McGrath's collected poems, The Movie at the End of the World. The film is a lot of lists, from the name-calling open of the narration to the catalog of names for heaven to the fruits and vegetables of the final poem, Praises. Chameleon-like narration tries to echo and conspire with what the poet says. Due to the anonymous nature of the screenwriter's art, McGrath is possibly the world's most heard, least known poet and writer. Author of twenty film scripts, his Imax works like Genesis, Living Planet and To Fly play and have been playing worldwide in twenty languages. Produced by The Center for International Education, The Movie was supported by grants from North Dakota Humanities Council, Minnesota State Arts Board and South Dakota Committee on the Humanities. The video is useful for teens and adults who are interested in poetry, American history, North Dakota, politics and film. Nationally broadcast on PBS, more than 200 schools, individuals and libraries have acquired it for their collections. 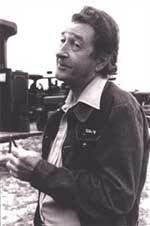 Thomas McGrath (1916-1990) shot on location at the Steam Threshers Reunion.